WILMINGTON – JAN. 22, 2019 – Today, the Delaware Blue Coats, the NBA G League affiliate of the Philadelphia 76ers, announced details for 76ers Fieldhouse Opening Night in addition to the team’s 2018-19 promotional schedule. 76ers Fieldhouse Opening Night is set for Wednesday, Jan. 23 when the Blue Coats host the Memphis Hustle at 7:00 p.m. Doors open at 6:00 p.m. and all fans in attendance will receive an exclusive T-shirt. The Opening Night celebration will include a special pregame commencement ceremony featuring local dignitaries and Philadelphia 76ers front office executives, beginning at approximately 6:30 pm. In addition, the game will include appearances by the team’s new mascot Coaty, the Sixers Dunk Squad presented by Dunkin’ Donuts, Sixers Dancers, and the Sixers Stixers drumline. 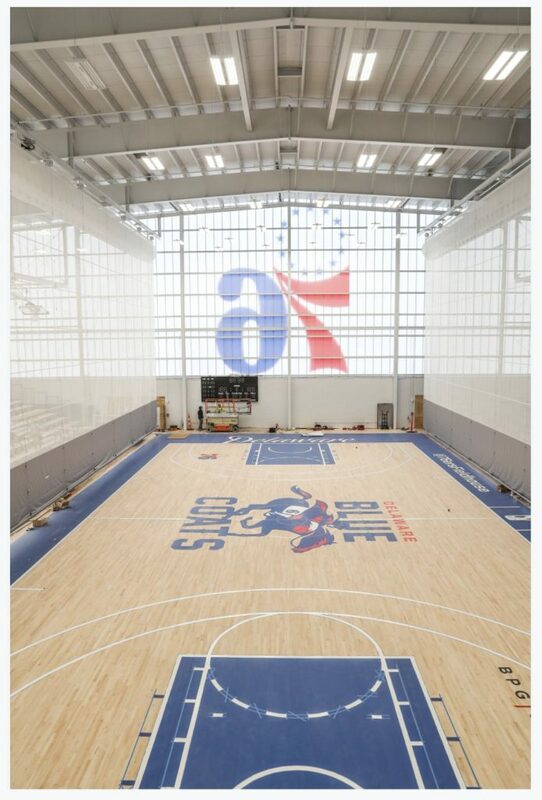 Construction began on the 161,000 square-foot 76ers Fieldhouse in August 2018. The Blue Coats’ NBA G League arena houses 2,300 seats, including 316 courtside seats and a premium club level. The multi-sport complex is positioned to host youth sports and community events throughout the year and features three basketball courts in total, with both an indoor and outdoor turf soccer field opening in the coming months. Additional information on Blue Coats games at 76ers Fieldhouse, including venue details, parking procedures and fan experience guidelines can be found HERE. Headlining an action-packed second-half promotional schedule, 76ers Fieldhouse will host Black History Month Celebration (Feb. 7), 76ers Night (Feb. 22), Salute to Service Night (March 9), Heroes vs. Villains Night (March 16) and Pro Wrestling Night (March 23). The full 2018-19 Delaware Blue Coats promotional schedule is listed below. Taking centerstage at 76ers Fieldhouse will be 76ers two-way players Shake Milton and Haywood Highsmith. Each NBA team may have up to two players under NBA two-way contracts who will spend the bulk of the season in the NBA G League and not more than 45 days with their NBA team. The G League features a record 27 teams this season with the addition of the Capital City Go-Go, the NBA G League affiliate of the Washington Wizards.